Getting busted in GTA III. 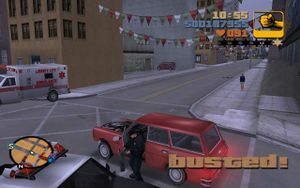 Being busted refers to a player being arrested by the Police or any other type of Law Enforcement in a Grand Theft Auto game as a result of having and failure to escape from a wanted level. At higher wanted levels law enforcement is more likely to attempt to kill the player rather than arrest them, though if given the chance they will still try to pull the player out of their vehicle. Getting pulled out of a car/helicopter/plane or getting removed from a bike. On the ground as a cop is standing over the player (mainly in hand-to-hand combat). Getting knocked over while trying to steal a cop car (while a cop is inside). As a result of getting busted the player will lose all of their weapons, body armor and fail any mission they were currently taking part in. They will then be processed near the closest precinct. A small amount of money will also be taken by the police as a bribe. Though in GTA San Andreas, if the player is dating Barbara Schternvart they will get to keep their weapons. In GTA Vice City Stories, a wage of $2,000 will see that the player is granted their weapons back. In the iOS and Android versions of GTA III, getting busted or wasted never removes the player's weapons, only armor and $1,000. In Grand Theft Auto IV and Grand Theft Auto V, the player is permitted to resist arrest by breaking away during the arrest. This can only be done if being held at gunpoint by an officer. Doing such will earn the player a two-star wanted level. In Grand Theft Auto: Chinatown Wars, getting busted will cost the player any drugs which are currently held, while any in a stash box are safe. The cutscene shown when the player gets busted in GTA Chinatown Wars. The alternate cutscene shown when the player gets busted in GTA Chinatown Wars. In GTA Vice City, GTA Liberty City Stories, and GTA Vice City Stories, if the player is wasted by a law enforcement officer, the camera angle will behave as though that officer busted the player. This page was last modified on 2 May 2015, at 05:41.